Are you looking for Port Canaveral Hotels with cruise parking. Whether you want an hotel room and parking or just need a place to park your car while you cruise, there are lots of options in Port Canaveral. All of these hotels are near Port Canaveral Cruise Terminal with a shuttle service and a place to park while you cruise. You do not want to be stressed when you are arriving at the cruise port. Our advice is to always make sure that you arrive the day before the cruise sets sail. There is a good choice of Port Canaveral hotels which are close to the cruise port. Sometimes the cost of an hotel room with parking is not much more than just the parking option. 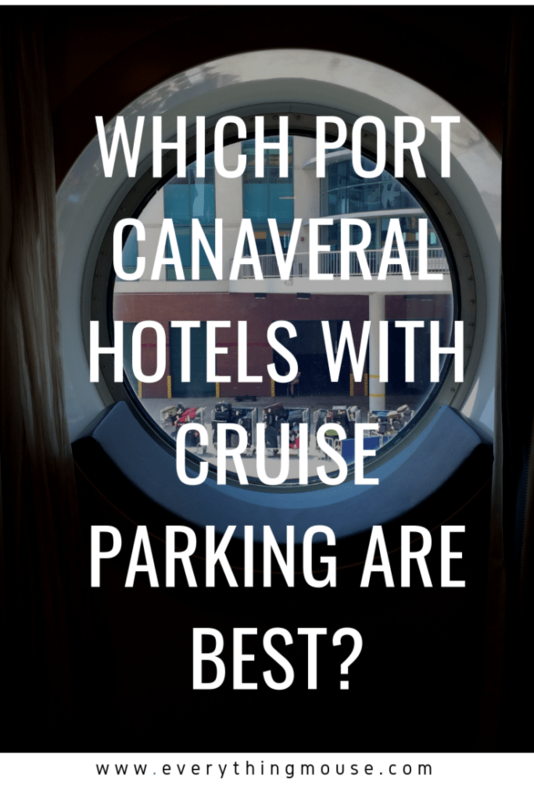 Here are some of the best Port Canaveral Hotels with Cruise Parking. The Country Inn and Suites is a very popular choice for those cruising out of Port Canaveral Florida. It is located at 9009 Astronaut Blvd, Cape Canaveral, FL, 32920. The location really could not be any better as it is the closest to the Cape Canaveral Port. The shuttle only takes 5 minutes. You can book the hotel with just a room or as part of a park and cruise package. This 150 room hotel is highly rated by reviewers with the majority reporting that they would recommend Country Inn and Suites Cape Canaveral. The rooms are clean and spacious. They have King and two bedded Queen rooms available. There is a small refrigerator in the room as well as a coffee maker. There is also coffee and cookies available in the lobby 24 hours a day. The complimentary breakfast is a step above the ordinary. It includes hot items such as eggs, bacon, and waffles as well as the usual cereal, fruit, bread and oatmeal choices. Good To Know: A Family Suite is available. This has a large dining table, a bedroom with a queen bed and a children’s bedroom with two twin beds. Great to accommodate up to 6 people. Best For: Those looking for a convenient, clean hotel with friendly staff which is just 5 minutes shuttle from the Cape Canaveral cruise port. The Radisson Resort at the Port Cape Canaveral is another great hotel which is close to the cruise port. It is located at 8701 Astronaut Blvd,Cape Canaveral, FL 32920. If you want a hotel close to Cape Canaveral Port which has an amazing pool, this is definitely worth considering. The property is motel style with outdoor corridors and rooms leading directly to the parking lot. It is one of the larger hotels in the area with 284 rooms. Standard rooms are a generous 285 square feet and offer a choice of King or two Queens. Rollaways are available for an additional $10 per night. There is also a One Bedroom option which sleeps up to 6 guests. There is an onsite restaurant which offers lunch and dinner. Breakfast is also available for an additional charge. This hotel is close to other dining options which are within easy walking distance. This includes an excellent pizza restaurant and a Thai restaurant as well as a Subway and a MacDonalds. You can book a park and stay cruise package. However, if you just book an hotel room you will be charged $6 for the shuttle journey to the port. Best Features: Fabulous Resort Swimming Pool and close to the cruise port. Good To Know: Restaurants are within walking distance. Service can be inconsistent. Best For: Guests looking for a great location close to Cape Canaveral port who want to take advantage of the pool facilities. The 150 room Residence Inn by Marriott Cape Canaveral is located a 3 minute drive to the cruise port. The address is 8959 Astronaut Blvd,Cape Canaveral, FL 32920. The rooms available are either Studios or Suites. All rooms are spacious and all of the Suites have a full service kitchen with refrigerator, microwave, stove, and dishwasher. These rooms are a very good size with the Standard One Bedroom Suite offering 500 square feet of space. There are some two bedroom suites available which are a very spacious 750 square feet. A hot American breakfast is included in the rate of your stay at the Residence Inn Cape Canaveral. There is an outdoor pool and a small fitness room at the hotel. There is a shuttle to the cruise port which is available for a fee. There is no restaurant in the hotel. However there are dining options close by. Kelsey’s Pizzeria and Thai Thai III Restaurant & Sushi Bar are just 0.3 miles away. The excellent Grill’s Seafood Deck & Tiki Bar on the waterfront is 0.7 miles away. Best Features: Close to the cruise port with very large spacious rooms and friendly service. Good To Know: No restaurants on site, but some good options are close by. Hertz rental cars are located within walking distance. Best For: Guests looking for a hotel with very large rooms and kitchenette facilities which is close to the port with a shuttle service. The Homewood Suites are a fabulous cruise port hotel option which is located at 9000 Astronaut Blvd,Cape Canaveral, FL 32920. This is always either our second or first choice of Cape Canaveral Port hotel. Always a big fan of the Homewood Suites concept as it offers large suites with kitchenettes. Perfect for a family stay prior to a cruise out of Port Canaveral. Homewood Suites Cocoa Beach is just about one mile from the cruise port. The hotel offers a shuttle service to your cruise ship and back for $6 per person. You can also buy a Park Cruise and Stay Package which includes parking for your vehicle whilst you are on the cruise. King and Queen Suites are available. Every Suite has a sleeper sofa in the living area which is great for the kids. Each suite has a kitchenette with full-size refrigerator, microwave, dishwasher and twin burner stove. There is an excellent free hot breakfast in the morning. If you are staying Monday through Thursday there is an evening social with complimentary snacks, a hot entree and free beverages including wine and beer. There is even a free grocery shopping service if you want to prepare your own meal or perhaps get some wine to take on your cruise. There is a nice swimming pool and a decent sized fitness room. No restaurants onsite but rooms do have kitchenettes and there are plenty of places to eat locally. Best Features: Very spacious rooms with kitchenettes. Good To Know:Excellent hot breakfast and Evening Reception (Monday through Thursday). Best For: Guests looking for a great hotel with very spacious rooms and kitchenette facilities. Ideal for families. This is a motel style property with rooms on the second and third floor having outside corridors. It is located at 3425 N. Atlantic Ave., Cocoa Beach, Florida, 32931 which is around 4.5 miles from the cruise port. All of the 150 Hampton Inn rooms have private balconies, including accessible rooms. Many of the rooms have ocean views. The very close location to the beach make this a popular property to book before a Port Canaveral cruise. The Hampton Inn has a choice of either King or two Queen rooms. Each room has a sleeper sofa. There is a good breakfast in the morning with some hot food item choices. There is a shuttle to the cruise port which is available for $5. The shuttle journey is around 10 minutes. Best Features: Very easy access to the beach. Nice views from the Ocean View Balconies. Good To Know:Excellent hot breakfast. Further out from the cruise port at 4.5 miles. Best For: Guests looking for a hotel close to the beach. 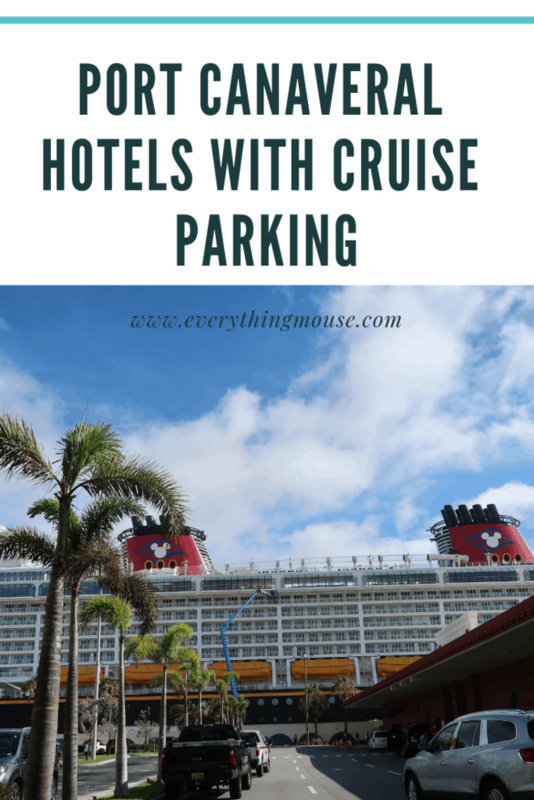 If you do not want to stay in an hotel prior to the cruise, many of these hotels offer car parking only. Check directly with the hotel as to pricing. If you want car parking closest to the cruise port you can see our Guide Here.